This week the years 3rd Major, The Open Championship, takes place at Royal Liverpool Golf Club in Hoylake, and to mark the occasion of this prestigious tournament, Titleist South East Asia is running an Open Championship Sweepstakes. As with any Major, Royal Liverpool Golf Club will be a tough test for all those competing. Scoring will be difficult, and an in-form short game will be vital to anyone looking to mount a serious challenge. As well as being able to play the right shots, it’s crucial that golfers playing have the right equipment to execute those shots with. And what better than the new Vokey Design SM5 Wedges to help golfers do the job at the Open Championship this week. 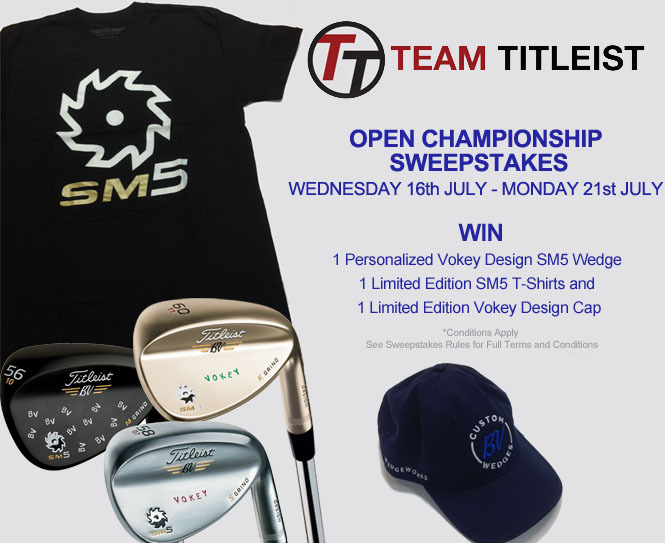 Titleist South East Asia will be giving 1 lucky winner a new Personalized Vokey Design SM5 Wedge, along with some other limited edition goodies (1 Vokey Design Limited Edition T Shirt and 1 Vokey Design Limited Edition Cap). 3 Runners up will also be selected to win a Limited Edition Vokey Design T Shirt and Cap. To enter simply fill out the form below. And feel free to head to the Team Titleist Discussion page (http://www.titleist.com.my/teamtitleist/sea/f/default.aspx) to chat more with Titleist enthusiasts about the Open Championship.